The Valkyrie is a legendary figure from Norse mythology. Tasked with selecting the fallen souls from the field of battle, they are no slouch in battle themselves, and this Valkyries Armor is the perfect lightweight garb for such a warrior-woman to wear. This armor is fitted for a woman, as it consists of a corset-styled top that combines rich and luxurious hues of brown with black accents to create something fit for a true warrior-woman. The corset-styled breastplate features a black abdomen that is decorated with twin brown leather plates adorned with Celtic dragon engravings. 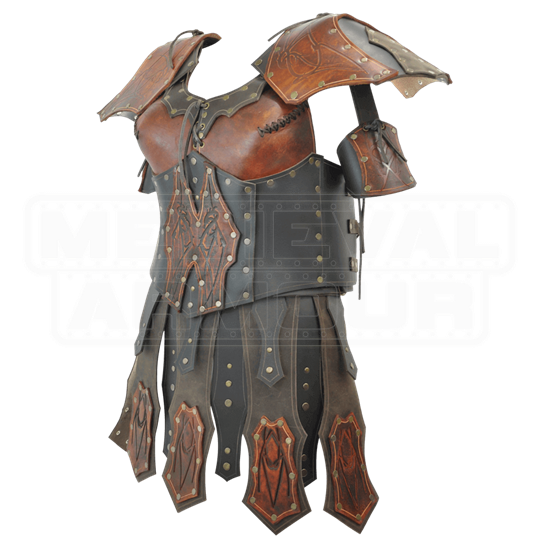 The top of the armor features thin shoulder straps set with grommets, while the chest of the armor is a single layer of shaped and stitched brown leather with lacing closures in the front. The armor is crafted almost entirely from 9-10 oz. leather, making it lightweight to wear yet strong enough to withstand the rigors of LARP and mock combat. This suit of Valkyries Armour does not just include the corset-styled chest piece, though. 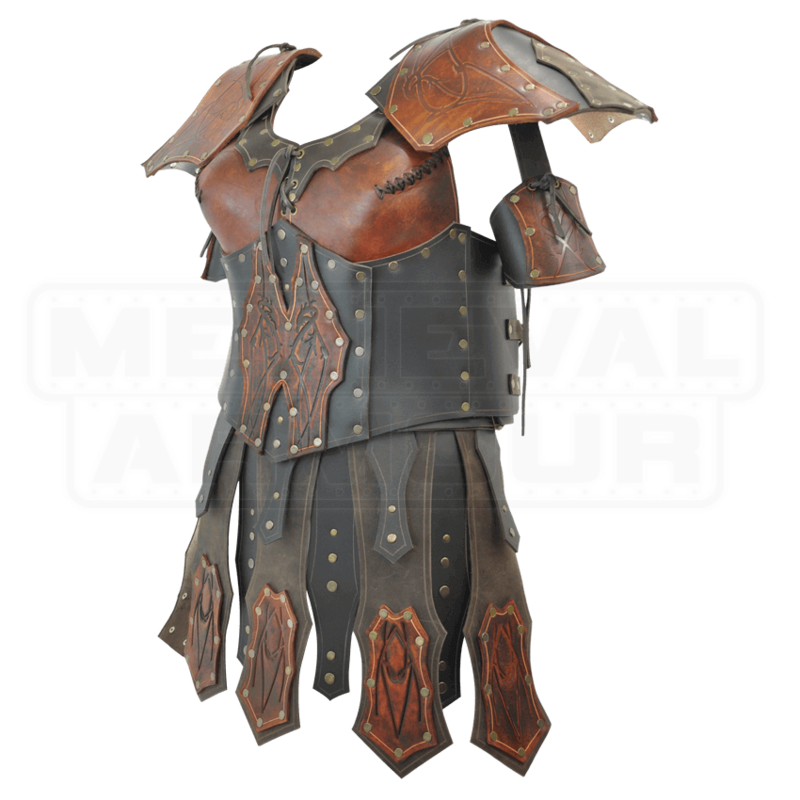 It also comes with a pair of pauldrons, echoing the brown and black design of the armored corset, complete with matching engraved Celtic dragon designs. Each pauldron ties onto the shoulder strap of the armored corset and extends off, while also featuring an arm-cuff that is worn around the arm to give the pauldron movement. Also included is a tasset skirt that features three engraved leather tasset plates, as well as several more decorative hanging leather strips to create a full skirt effect in the front and a partial skirt effect in the back. This armor is available in one color and four different sizes. As the corset style top is fastened via 8 small leather straps with buckles on the back with one over each shoulder and three on each side. Each size is also somewhat adjustable to personal preference and comfort. With that in mind, please order your armor in the size that closest matches your personal measurements, and then adjust to comfort. Wearing this Valkyries Armor, you will look like one of the maidens of battle right out of Norse mythology, which means you will look like a fierce warrior ready to fly into battle and show those men how a real warrior fights.